When it comes to comfortable footwear, no one does it quite like Crocs. The foot-friendly lineup is recognized primarily for its clogs, but recent additions to the burgeoning collection prove that there is much more to Crocs than meets the eye. LoveToknow spoke with the brand's public relations manager, Shelley Weibel, and its lifestyle expert, Alison Deyette, to get their thoughts on some of Crocs' hottest designs, how to wear them and what fans can expect from Crocs in the future. 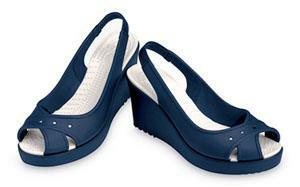 LoveToKnow (LTK): What do you think sets Crocs apart from other comfort shoes? Shelley Weibel (SW): The profound comfort and support that is only available with our Croslite™ material, which is the core of every pair of Crocs shoes. I also think our large selection of styles is something very unique - Crocs shoes come in wedges, flip flops, flats, and dozens of other styles, so you don't have to sacrifice comfort for style or variety. LTK: Shoes like wedges, peep toes, and even flats can sometimes pose painful problems. What is it about Croslite that prevents this type of discomfort? SW: Croslite™conforms to and cushions feet for a wearable hug. The material conforms to your foot for a custom fit so even if you're wearing wedges or peep toes, Croslite is there to keep your feet comfortable and lovingly taken care of. Alison Deyette (AD): You're getting the whole package with these shoes, including price and value and, of course, shoes you'll enjoy wearing. Croslite™ makes wearing even high-heeled wedges all day a breeze. You've got to try them on, and once you do you'll be hooked! I keep coming in contact with other fashionable friends whom I share my story of the pair of Crocs I've been sporting recently while traveling. Either they're completely surprised when they see the shoes since they would have never guessed they were Crocs or they talk about the pair of Crocs they bought within the last few months and how they adore the comfort. You can wear these from work to the beach, running errands or to dinner. Allison also shares some suggestions for styling the perfect outfit and incorporating the shoes into work, weekends and evenings out. She suggests a Crocs wedge to pair with "your favorite little black dress for a girls' night out, a summer shift for shopping around town, or with boyfriend jeans and a T-shirt for a casual, stylish look." She says, "I also like the Crocband flat in preppy navy to pair with your white shorts or cropped cuffed denim for weekend errands. Or pack a feminine flat in black, navy, or espresso in your suitcase as your go to shoe to wear with floral sundresses, beach cover-ups and cute a-line skirts on your next vacation. Twentie: A playful, leather-wrapped wedge with stylish cut outs at the top of the shoe and near the toe. A-Leigh: A cute, peep-toe slingback wedge with a cork heel. Grace: A simple, but very versatile pair of flats that can be worn with almost anything. Kadee: Also vailable in colors and prints, the Kadee is a slightly jazzed up version of the classic ballet flat. "The inspiration for Crocs products come from a variety of places -- extensive research, watching trends in the marketplace and most importantly, from consumer feedback. The Crocband is a twist on our classic look. Other new designs were inspired by recent trends, such as a cute and comfortable pair of peep toe flats. The men's Santa Cruz was inspired by the relaxed west coast vibe - a slip-on loafer style shoe but with a modern twist. The Santa Cruz is part of a collection of laid-back, deconstructed shoe designs especially for men that offer flexibility and comfort using casual materials such as canvas and leather. We recognize our consumers' on-the-go lifestyle, so we strive to make comfortable shoes that fit their full lives." LTK: Why are you passionate about the Crocs brand? SW: My passion for the Crocs brand began after seeing firsthand how consumers reacted as we introduced new designs that fit their lifestyles. Today, our shoes offer consumers a product unlike anything else on the market. No other footwear company provides the comfort of Crocs with such a variation of designs - more than 120 styles! I love how there's a shoe for every wearing occasion - to the beach, the grocery store, work, and even to weddings! LTK: Alison, how did you get involved with Crocs? AD: My partnership with Crocs is a natural fit -- we are both focused on helping individuals look and feel great and live life on their own terms. 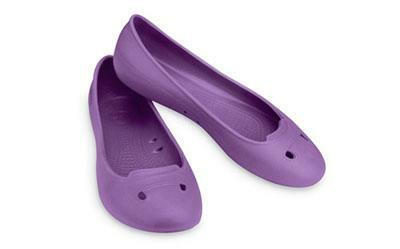 In the past, I only thought of Crocs footwear as a one shoe brand, the clog style. However, I was completely surprised to find so many different and fun shoes. I found styles for everyone, and for many occasions, from shopping with the girls to an afternoon barbecue with the family. LTK: What can we anticipate from future Crocs collections? SW: We've got some very versatile, stylish wedges, flats and boots for women that are perfect for fall and winter. These styles can take you from work to a holiday party, and everything in between. For men, expect some new, lightweight, all-occasion loafers that can serve as a work or on-the-town dress shoe and some unexpected style surprises, too! Find the latest collections, more information about Crocs, or purchase online at the Crocs Web site.